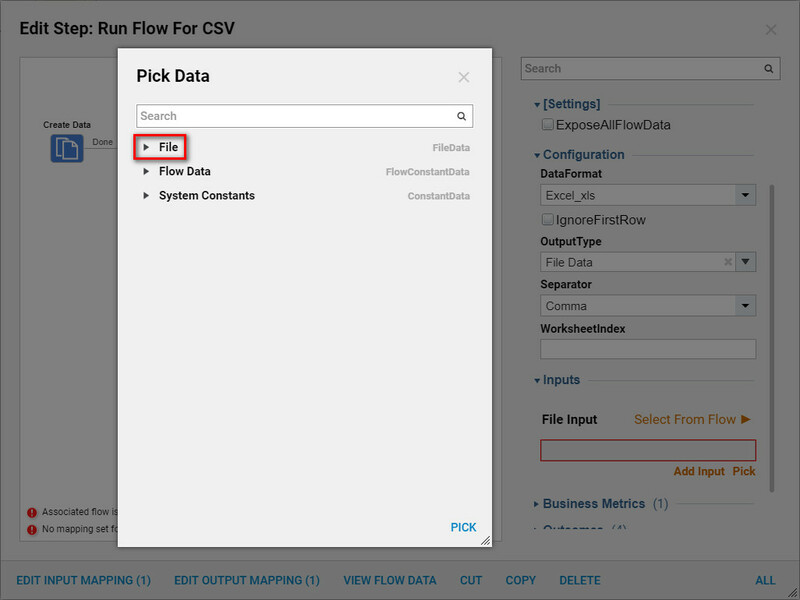 This tutorial shows how to use Run Flow For CSV	step. 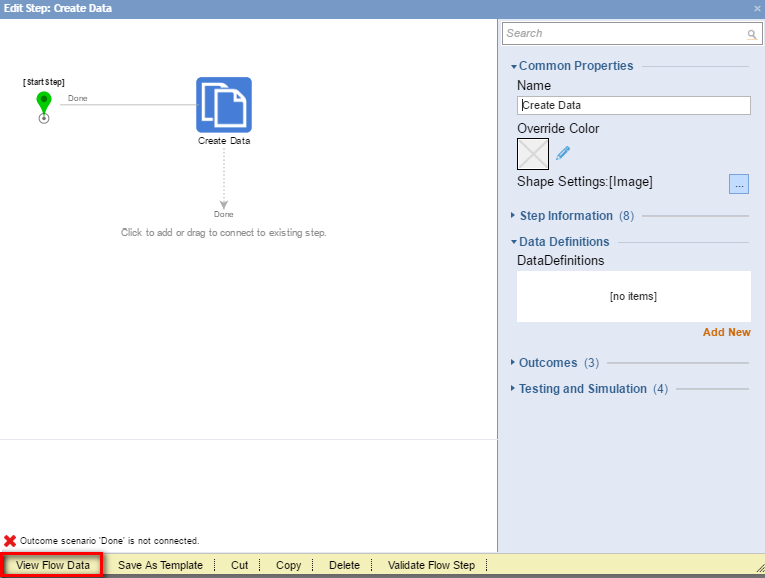 This step can be found in Data > List > Excel and CSV	category in the ToolBox	. 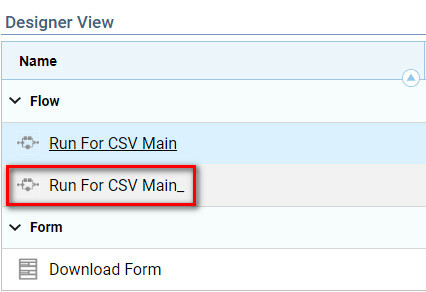 In this Example we will use Run Flow For CSV	step to replace a Row in theExcel Document using this subflow Step . 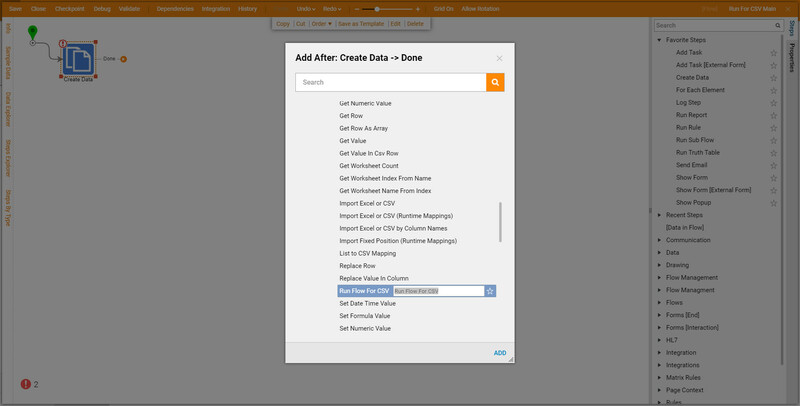 In the resulting Data Definitions	pop-up window we click Add New	link to add new data definition for this step. 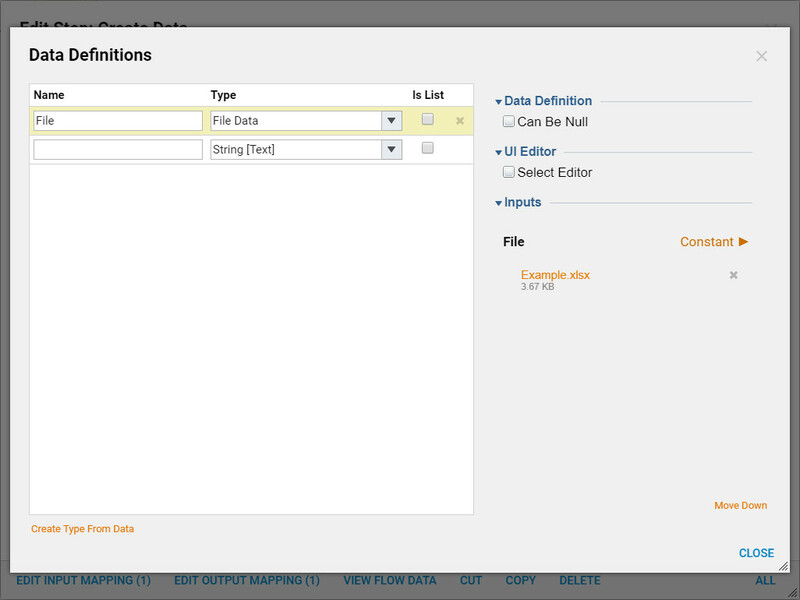 Then, we Name	our Data Definition and pick FileData	type for it, using Type	selector. 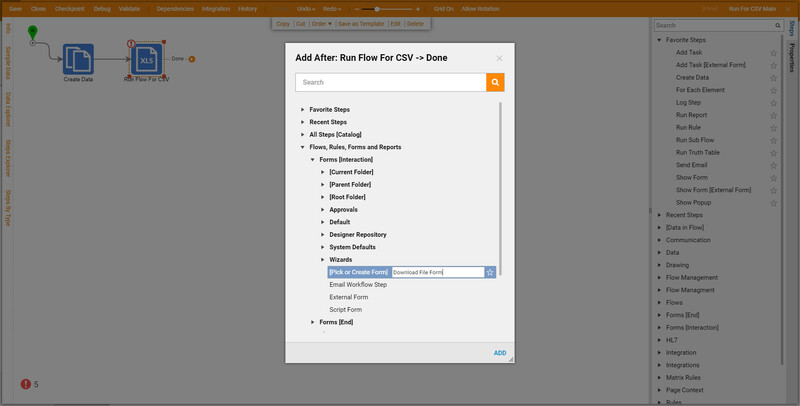 Next, we add Run Flow For CSV	step from All Steps [Catalog] > Integration > Excel and CSV	category in the Flow Designer Wizard. 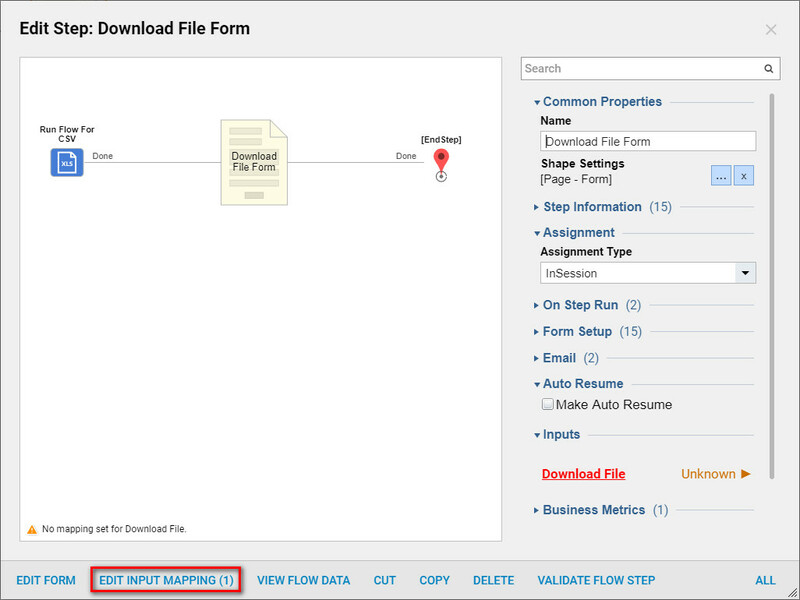 Then, we add aForm	from the Flows, Rules, Forms and Reports > Forms[Interaction] > [Pick or Create Form]	. First – Button	control from Actions	category for Form to have at least one Outcome	. 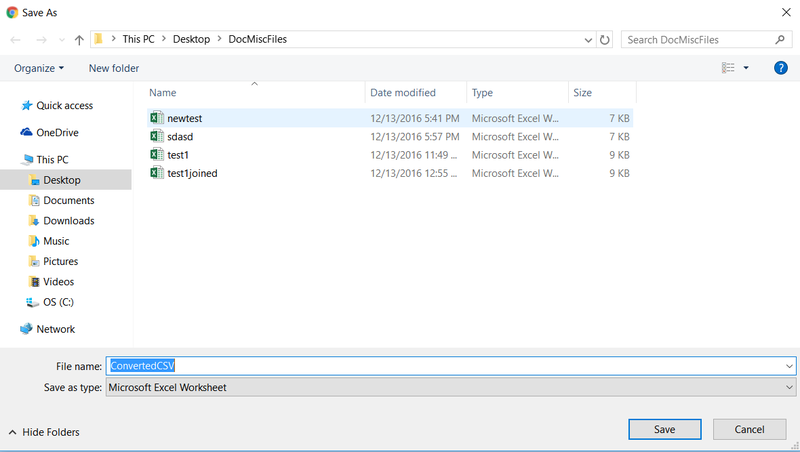 Second – File Download	control from File Handling	category for user to be able to download edited Excel Document . 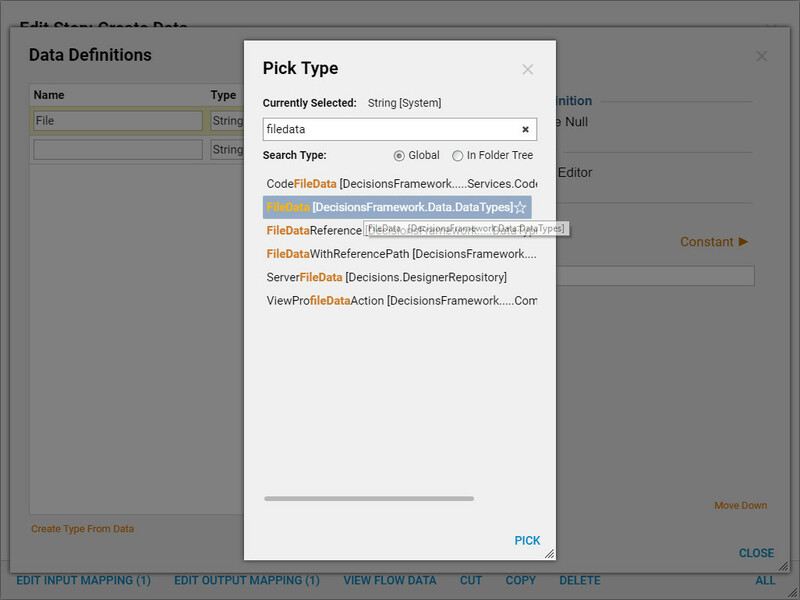 First, we selectCreate Data	step on the workspace. Then, we navigate to its Properties	. Next, we locate Inputs	section and using Choose File	we select our Excel File. 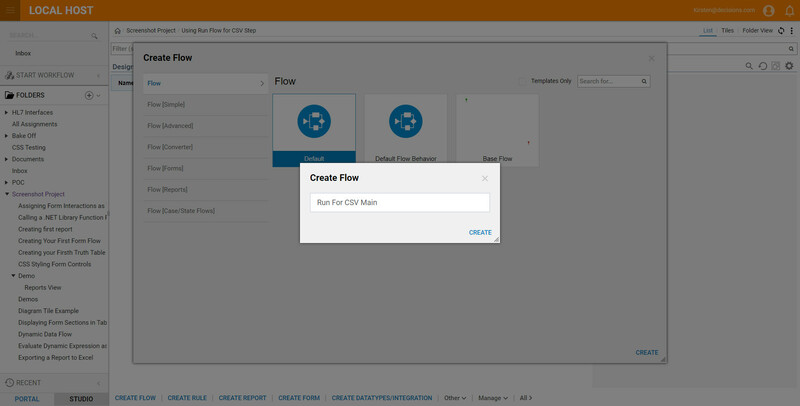 Then, we select Run Flow For CSV	step on the workspace and configure its Properties	as follows. 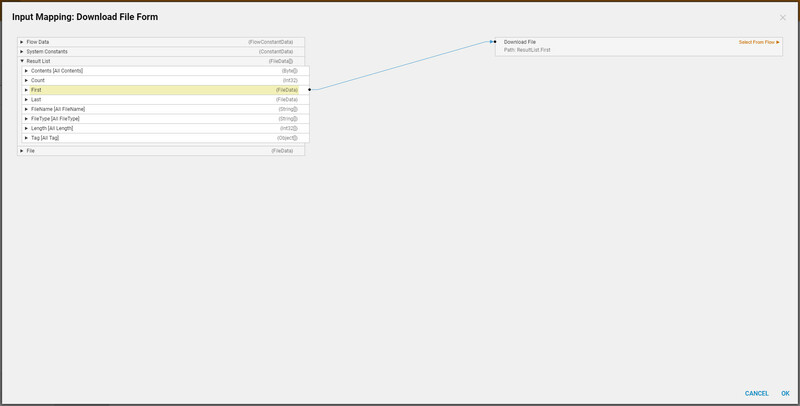 In the Current Designer Folder, find the associated Flow for CSV. The flow is automatically generated and sits in your Current Designer Folder, renamed with an underscore (e.g. main flow: FlowName, sub flow: FlowName_ ). Open this flow. The Flow Designer window opens. 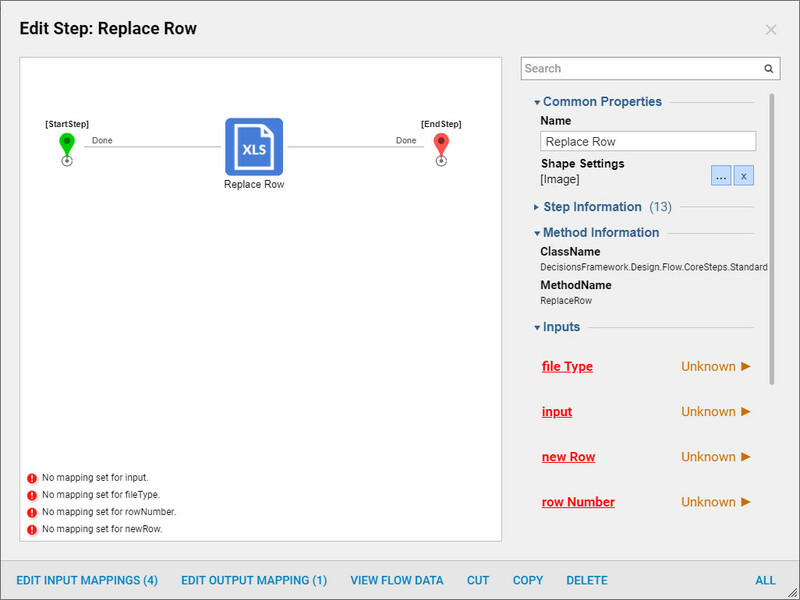 First, we add Replace Row	step from All Steps [Catalog] > Integration > Excel and CSV	category in the Flow Designer Wizard. Next, we connect Replace Row	step to the End Step	. 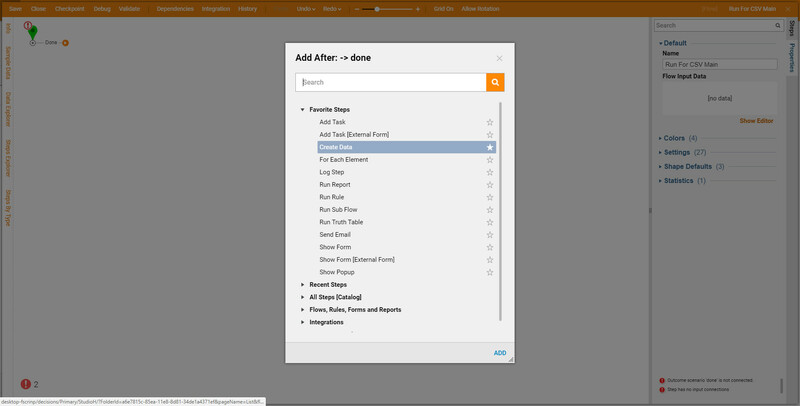 Call Mapping Editor	for the Replace Row step from its Action Menu . In theMapping Editor	we use RowData	input to this Sub Flow for defining file Type	as FileType (CSVFileType)	and input	as FileData (FileData)	fields. Next, we define Constant	value for new Row	. 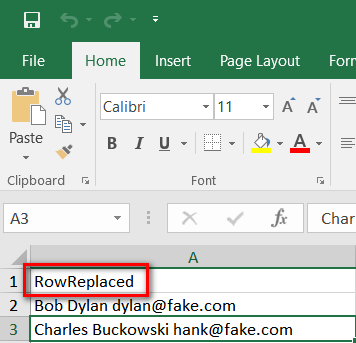 In this example we want to replace the first Row in our Excel Document . We define row Number	as 0	. We click Ok	to save and close Mapping Editor. Back in the Flow Designer we select End Step	on the workspace. 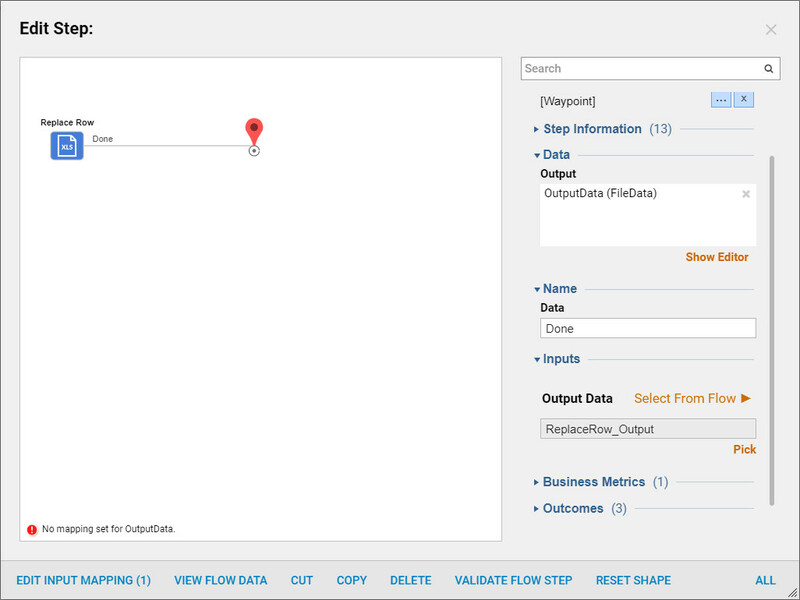 Using Step Information Layer	we map Data	for the predefined OutputData	variable. We select Mapping type	as Select Value,	and using Path picker	we pick the outcome data from Replace Row step. And this completes our Sub Flow . We can save it and close this Flow Designer. 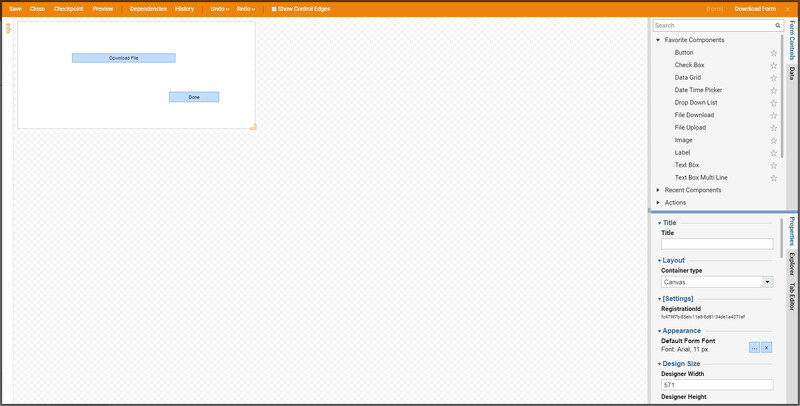 Back in theMain Flow Designer we select our Form Step	and choose Show Mapping Editor	option for this Step . 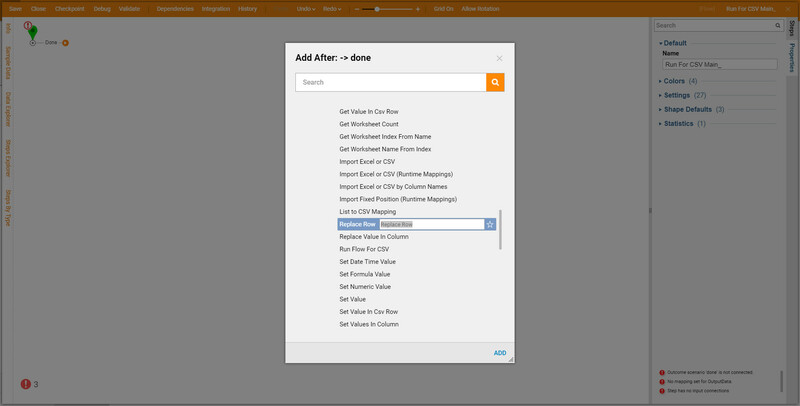 In the Mapping Editor	we are using First file from the ResultList	(the outcome from Run Flow For CSV step ) as an input for our DownloadFile	control. Then, we save and close Mapping Editor. Back in the Flow Designer we connect all steps in our Flow as following… This, completes our Flow . 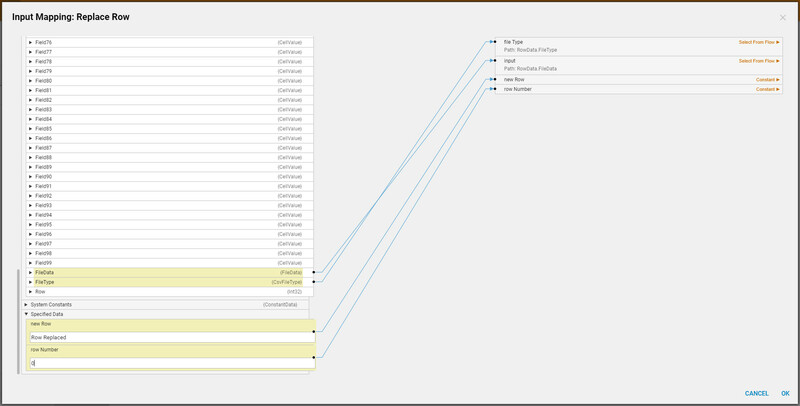 We click Debug Flow	link on the Top panel of the Flow Designer to test our Flow . 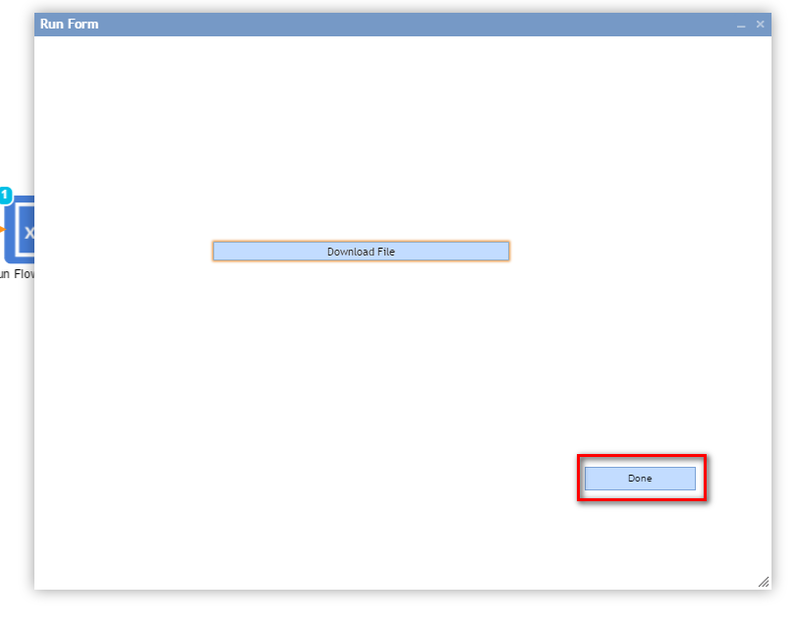 Our Download File Form opens in the Debugger	and we click Download File	control. Then, we Name	our updated File and Save	it. We click Done	control on the Form to close it. Diagram Tab	in the Debugger indicates that our Flow executed successfully with no errors. When we locate and open our Updated Excel Document, we can observe that first row was replaced for the value we have provided in the sub Flow .